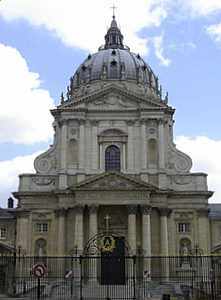 The Church of Notre Dame du Val de Grace was begun under the inspiration of the wife of Louis XIII, Queen Anne of Austria. After twenty-three years of marriage, she conceived a son who was to become King Louis XIV. In gratitude for the birth of her son, she set in motion the plans to build a church on rue Saint Jacques. On the 1st of April, 1643, the seven year old future king of France, along with his mother, laid the first stone of the church. The Church was modeled after the most beautiful churches in Rome and the architects involved in its construction were the most famous of the time. The first architect, Francois Mansart, the grand master of classical French architecture, was responsible for the initial design and the first stages of the building project. It was he who overcame the many problems encountered in the location of the church and palace. His keen eye and attention to detail is evident in the imposing courtyard and facade of the church which is reminiscent of the Escurial palace in Spain. Mansart was succeeded by Jacques le Mercier, the architect responsible for the Chapel of the Sorbonne, and by another eminent classical architect, Gabriel Le Duc. The building was completed in 1667 and adhered closely to the plans laid out by Mansart some 25 years earlier. The Cupola of the Church is the work of Pierre Mignard,while the statuary and the columns were realized by Philippe Buyster. The entire Church is one of the jewels of Paris art and architecture.